On November 21st it is time for Commotie's annual student-lecturer activity! 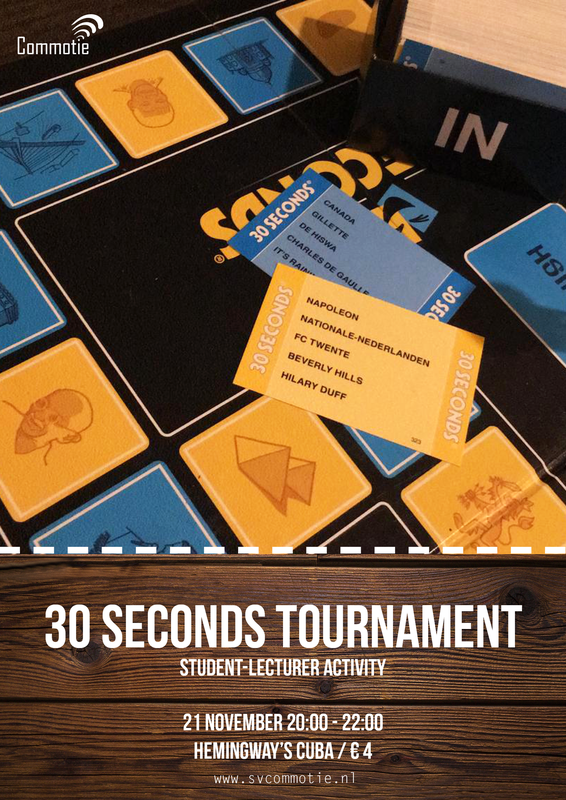 This year we will organize a 30 seconds tournament where you and the lecturers will compete for the title of best 30 seconds team! So do your research so you are able to be the best 'describer' and 'guesser' of the evening. Enjoy this fun activity and get to know your professors in a very different setting than in lecture rooms. The evening will start at 20:00 at Hemingway's Cuba so be on time! We will explain all the controversial rules of 30 seconds as well at the beginning of course! The price will be maximum 4 euros! So sign up for this nice evening where lecturers and students are mingled together!